Las Piñas, Metro Manila is known for two things: the Bamboo organ and its lantern retail every Christmas Season. By lantern, I meant the parol or star-shaped Christmas lanterns from the Philippines. Traditionally, the lanterns were made of bamboo sticks which were then covered with Japanese paper or crepe paper. In due time, the papers as materials were dumped and colored plastics were used. Practical, though not eco-friendly if you ask Al Gore. The plastic covered lanterns can be used over and over again whereas the paper covered lantern is good for one Christmas only. See, above, the beautiful plastic-covered lanterns. Today, the plastic-covered lanterns have come a long way. Lanterns are still covered by plastics but the design has evolved into more complicated and lighted lanterns. Ethan and I went to Las Piñas one night to see the beautiful-colored-lighted lanterns for sale by the roadside. The street was fairly busy because of the parked cars whose owners were by the lantern stalls, buying. If you look closely at the picture above, extreme left, a lantern snowman is also displayed. Now, I ask, what the heck is the relevance of a snowman as the Philippines is in the tropics? I actually saw some lantern snowmen prominently displayed in the most exclusive of South of Manila villages. They looked pathetic all wrapped in clear plastic for rain protection. I did not buy any for the cheapest that I could find was at 1,750 Php. Totally a far cry from the 5.00 Php parol of long ago. 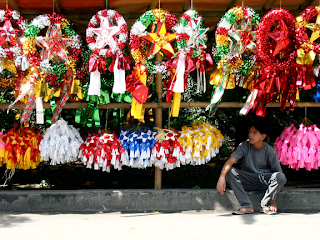 That school I went to in high school [yung sister school ng Assumption na binisita ata ang anak mo] used to make really nice parols na pang contest...that's before the Paskuhan Village sa Sn Fernando, Pamp. I miss seeing these parols kasi wala ata dito nyan. I only see lots and lots of lights and blow ups. 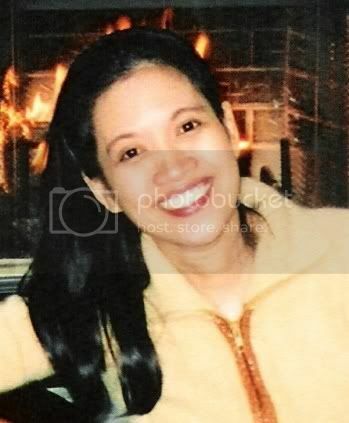 Hay naku...kaka miss talaga.